Give the gift of health and let us do the eco-friendly wrapping for you. 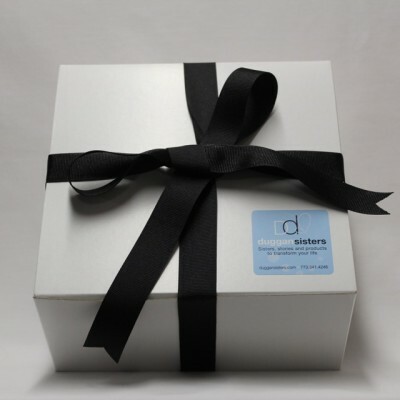 We offer 100 recycled gift-wrap tied with a luxurious grosgrain ribbon for these exclusive Duggan Sisters boxed gift sets. This five-piece gift set includes two luxurious baths and the ongoing enjoyment of coconut soap and exfoliating gloves. Eucalyptus smartsoaks relieve sinus congestion and ease flu symptoms. Lavender smartsoak: Magnesium sulfate, sodium bicarbonate, asorbic acid, juniperus communis (juniper), lavandula angustifolia (lavender); Eucalyptus smartsoak: Magnesium sulfate, sodium bicarbonate, asorbic acid, juniperus communis (juniper), eucalyptus globulus (eucalyptus); Lavender washup soap: Cocos nucifera (coconut oil), elaeis guineensis (palm oil), lavandula angustifolia (lavender oil); Tea tree washup soap: Cocos nucifera (coconut oil), elaeis guineensis (palm oil), melaleuca alternifolia (tea tree oil).